Investors are rushing into passive products with the aim of achieving low-cost exposure to specific asset classes, without the risk of significant benchmark underperformance. But it’s not as simple as these impressive numbers suggest. It is important to understand the risks and hidden costs as well the benefits that come from investing in passive instruments. As with any investment, selecting the right passive strategy, and the vehicle, requires a thorough understanding and an in-depth evaluation of existing options to ensure investors’ expectations match reality. Assessing the type of passive product, its structure, benchmark, details of the market segment, and index used to create a proxy for it are all critical factors that need to be considered carefully - as well as fees and costs. When considering a passive investment, investors first need to decide the type of instrument that is likely to be suitable for their investment portfolio - these could be index mutual funds, ETFs or derivatives. If investing in ETFs, which have emerged as the vehicle of choice for many passive investors, the choice is then between physical and synthetic ETFs. While a physical ETF invests in an index’s securities, a partial synthetic or synthetic ETF uses derivatives such as swaps to track the underlying index. Whether ETF or tracker, physical or synthetic ETF, all these different passive instruments will deliver differing return and tracking profiles. Different passive instruments will also pose varying types of risk and offer varying levels of liquidity. Investors also need to examine whether some instruments offer better exposure to certain sectors and regions. For example, synthetic ETFs provide better access to emerging markets and non-metal commodities where physical ETFs are often not the best solutions for replicating market performance. Synthetic ETFs can be cheaper in illiquid markets where their tracking may also be more precise. Non-metal commodities can only be accessed synthetically because of the difficulties associated with storage. Considering the structure of the passive product very carefully can help identify the most appropriate vehicle to balance market exposure, return, risk and liquidity. Passive investors need to consider their exposure and identify what is actually being tracked. No two indices are the same. For example, an investor wanting exposure to North American large-cap equities can choose from several different indices ranging from the MSCI USA, the MSCI North America, the Dow Jones Industrial Average, and the S&P 500. These indices may cover the same market, but offer differing exposures - for example, the MSCI USA tracks 600 leading US stocks, while the S&P 500 tracks 500 large-cap stocks. Beyond these, there are at least 12 other alternative indices for small and mid-caps as well as equity factors - which include dividend-focused, growth and value. With such an array of choices, investors need to consider the composition of different indices to weigh up the type of exposure they want. Geographic tilts may be embedded in some of the indices. Most of these benchmarks are typically market-capitalisation weighted, which means they often have large-cap bias and are heavily concentrated in certain countries and sectors. For example, China accounts for around 30 per cent of the MSCI Emerging Market Index - this figure could go as high as 42 per cent after the country’s A shares are included in the index. Over 60 per cent of the MSCI World Index is concentrated in just the US. Analysing the benchmark’s exposure is key. Two seemingly comparable indices may have small but significant differences. 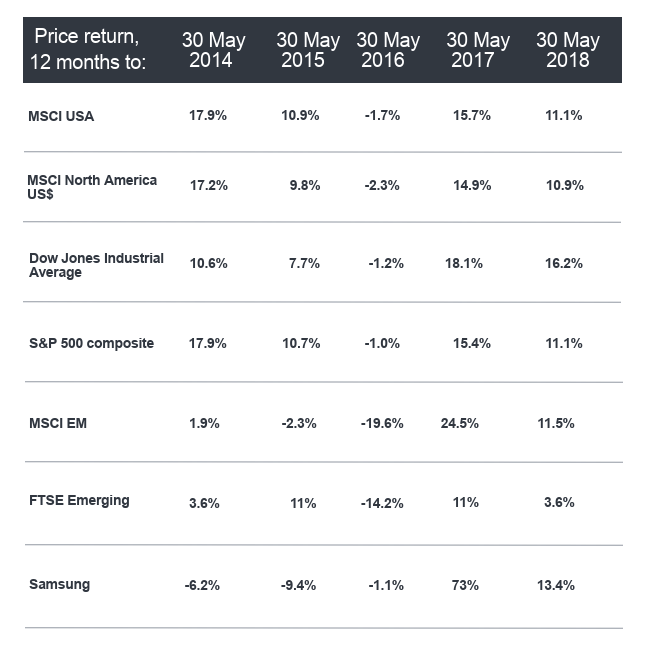 The FTSE Emerging Market index does not include South Korea in its portfolio weighting, while the MSCI Emerging Markets does - and in turn exposure to Samsung, which rose by 40 per cent in 2017. This had an impact on the performance of the two benchmarks: the FTSE EM index returned nearly 32 per cent last year, compared with 37 per cent for the MSCI EM index. In an ideal world, index funds would perfectly track their benchmark indices. But as this is not possible, investors need to understand the varying methods of measuring how well a fund tracks its benchmark. The difference between the return of the benchmark and the index is measured in two ways - tracking difference and tracking error. Tracking difference represents the difference in the return of the fund and the index, while tracking error is defined as the volatility of the tracking difference. It is important for investors to understand some key criteria which drive this difference between fund performance and its benchmark index. Fund charges are incorporated within the fund and can create a drag on performance when compared against the index. This fee can have a significant impact on returns over the long term, so ensuring that the price of a fund is competitive should be a key consideration. When physically replicating an index, fund managers often employ one of two tracking methods. The most common of these is full replication. This means creating an index portfolio comprising all relevant securities in the index according to their relative weight. This ensures tight tracking and means the characteristics of the fund are virtually identical to the index. But this can be difficult in some more illiquid markets and buying shares in every component means transaction costs mount up. The second method is sampling. This involves purchasing a selection of the securities that make up the index. This approach helps to mitigate liquidity issues or a large number of holdings in the index. The sample aims to match the fundamental characteristics of the index and to track its returns. This technique, however, increases the possibility of tracking error between the fund and the index. Regardless of the technique employed by the manager, their skill, defined by how effectively they execute their chosen method, still matters. 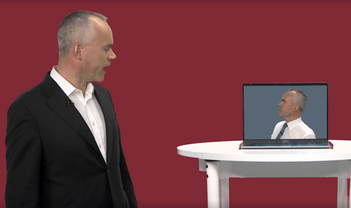 This skill can be difficult to isolate and is often assessed by tracking error which can be minimised by managing cash flows effectively and minimising transaction costs. The surge in passive investing has largely been due to the low fees compared to active products - but do they represent the true costs? The focus on headline total expense ratio (TER) for ETFs can often be misleading. For example, passive high-yield exposure with a low TER, may end up much more expensive after accounting for associated costs as the following example shows. Liquid high-yield index = Markit iBoxx USD Liquid High-yield index; standard high-yield index = BofAML US High-yield Index. Bid-ask spreads can push up overall costs of the product. In liquid markets, such as US equities, the spreads are narrow, in contrast to more illiquid markets like emerging markets and high-yield corporate debt where spreads can be much wider. The narrower the bid-ask spread, the lower the cost to trade. As bid-ask spreads are a function of liquidity, they are a critical component to the total costs of ownership. A wide spread can eat into the overall returns. The premium/discount to net asset value for ETFs in more illiquid markets can also be very volatile. 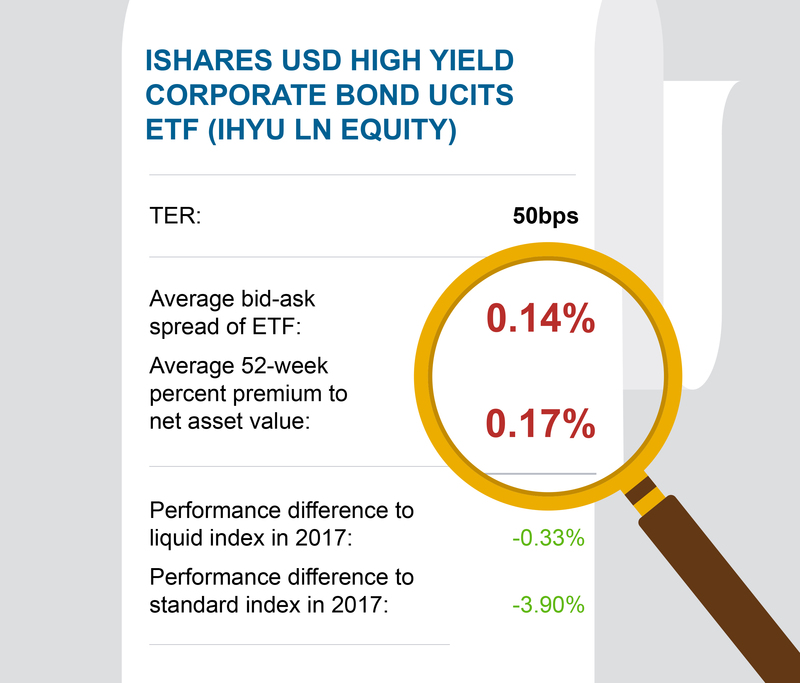 The iShares USD High Yield Corporate Bond UCITS ETF, a popular high-yield ETF highlighted in the graph above, ranged between a 1.29 per cent premium to a 1.78 per cent discount over the last two years - an enormous difference, particularly given this was a relatively quiet period for high-yield investors. Generally, premia or discounts tend to be short-lived, but investors should check before buying or selling an ETF. Liquidity of the underlying asset class or holdings as well as liquidity of the instrument need to be weighed up. An ETF is only as liquid as the underlying securities within the index it tracks. It can be expensive to replicate an index in illiquid asset classes and a lack of liquidity can create significant risks for investors in adverse market conditions or during increased market volatility. In asset classes such as high yield corporate bonds, ETFs tend to track a liquid version of the standard high-yield benchmark in order to offer a scalable product with intra-day liquidity. These custom liquid benchmarks tend to underperform consistently as they don’t benefit from the illiquidity premium which the standard high-yield index is exposed to. In other words, in certain asset classes such as high-yield debt, the ETF may be tracking a very different index - or may be using a different benchmark to the one the investor wants exposure to. Investors should also review their strategic asset allocation (SAA) and take into account the impact of lower returns in the liquid index. This would alter the risk-return profile in the SAA. The performance of the product in volatile market conditions also needs to be considered. In normal market conditions, there are two-way flows and ETF investors benefit from buying and selling in a secondary market. In stressed markets, however, sellers rapidly outnumber buyers. Unlike mutual funds, ETFs don’t have the option of holding cash, so when investors ask for their money back, an ETF manager potentially has to the sell the underlying assets in the market at whatever price they can get. When they sell, they do not pick the riskiest or most liquid markets first, but a slice of the entire underlying index. This can have a significant impact on performance and transaction costs, and can potentially take many unwary investors - who were expecting tracking of the benchmark with low fees - by surprise. ETF liquidity matters - if the underlying assets are illiquid, then it may be difficult to sell these investors or they may not achieve a reasonable price. The risks rise in stressed markets when trackers stop tracking underlying indices or when derivatives are used to maintain tracking synthetically. One practice which has allowed managers to cut the fees for passive funds is stock lending whereby assets in a fund are loaned on to third parties in exchange for a fee which is usually split 60/40 between investor and fund manager. Some, though not all, ETF providers have stock lending programmes in place to partially, or in some cases, completely offset their management fees. Stock lending is not always to investors’ benefit. The biggest risk from securities lending is counter-party default, where borrowers of these assets may not be able to return them. Much of this risk is mitigated by the borrower posting collateral to a third party, which the lender controls in the event of a default. But the quality of this collateral is important as the risk is 100 per cent with investors, not the fund manager. An investor in a FTSE100 tracker could find themselves the unwitting owner of Korean small caps. Furthermore, any income generated by stock lending is unlikely to offset the risks, especially in market downturns. When investing outside local markets, returns are subject to currency risk. In response, some index products track a monthly hedged index. 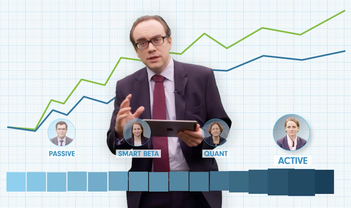 This fixed monthly hedging makes performance reconciliation relatively straightforward. However, the frequency can make the hedging less effective if there is a big variance between the hedge and the portfolio in between rebalances. More complex is a dynamic hedging methodology. This assesses the currency exposure of the underlying assets and adjusts the hedging position daily, based on the movements of the relevant securities, triggered by thresholds being breached. This approach is likely to result in a more accurate hedge and potentially a purer investment outcome for investors compared to a monthly hedge process. However, these products tend not to have a relevant index as a reference for performance measurement. As with all investment strategies, investors in passive strategies need to be clear about their strategic objectives and understand all the relevant risks before investing. Before allocating, they need to decide the building blocks they are going to use: active, passive, smart beta or alternatives. The effectiveness of specific passive products should then be assessed in the overall context of the portfolio’s targets and risk budgets. Investors also need to scrutinise the role that specific instruments are likely to play within the overall investment portfolio. When selecting the product, investors must analyse the market exposure they are trying to achieve, the product’s structure and performance, and the total cost of ownership, which involves looking beyond the headline fees. Costs of passive strategies, especially in illiquid asset classes, can add up and not all indices lend themselves to efficient, accurate replication. Picking the right passive strategy - and vehicle - requires good understanding and attention on the part of the investor to make sure the product delivers what it promises - and that there are no surprises. The point of passive investment is that it should be straightforward and should match investors’ expectations of risk and returns. That can only happen if a passive investor takes an active interest before handing their cash over.